It was getting late, I was starving, and I had some beef in the fridge that didn’t looked a bit too tough to make a great steak. Meat tenderizer in hand, I started pounding out the steaks thinking I’d be having chicken fried steak, for dinner. Sadly a block of sausage I’d been saving in the freezer for just such an occasion had disappeared and I was left without the fixins for country gravy. Surveying the pantry for alternatives, I dug out a can of tomatoes and a jar of olives and threw together a tomato olive sauce. It’s one of the simplest things I’ve cooked in a while and yet it was the kind of delicious that will make it a regular in my kitchen. The toughest part about making this recipe was coming up with a name for it. It’s vaguely Italian and yet despite my best efforts to Google a name for it, there was none to be found. 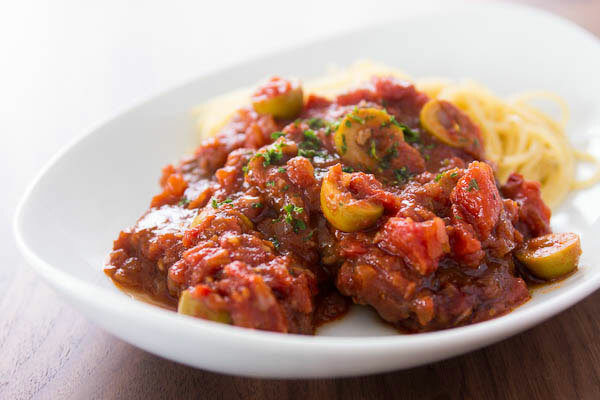 A generic name like “Pan-Fried Steak with Tomato and Olive Sauce” would certainly be adequate, but it lacks the panache that this dish deserves. That’s why I turned to Twitter for help under the hashtag #namingtroubles. It’s worked for me in the past and lo-and-behold a whole slew of suggestions running the gamut from goofy to creative came back. I ended up combining a couple suggestions and naming this dish Chicken Fried Steak a la Veracruz in an American South meets Southeast Mexico mélange. Take a meat tenderizer to make this chicken fried steak recipe with tomato and olive sauce for a colorful dinner. 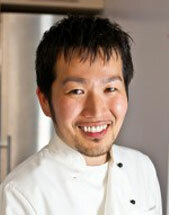 Marc Matsumoto shares how he came up with the name for this recipe in a post on the Fresh Tastes blog. 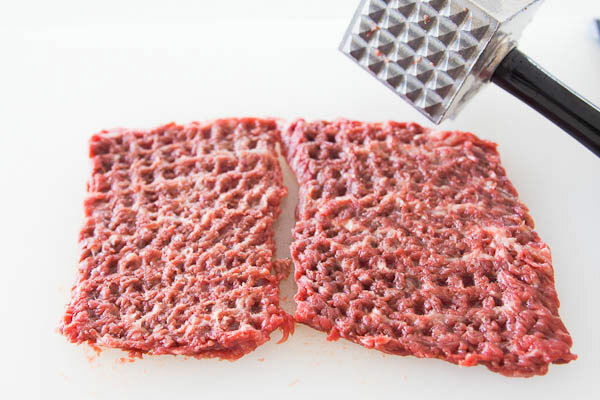 Use a mallet or meat tenderizer to pound the steaks out to about a quarter inch in thickness. When pounding the meat, don’t put too much force into each swing or your steak won’t flatten evenly. Salt and pepper both sides of the steak then dust evenly with the flour. In a frying pan, heat the olive oil over medium-high heat until hot. 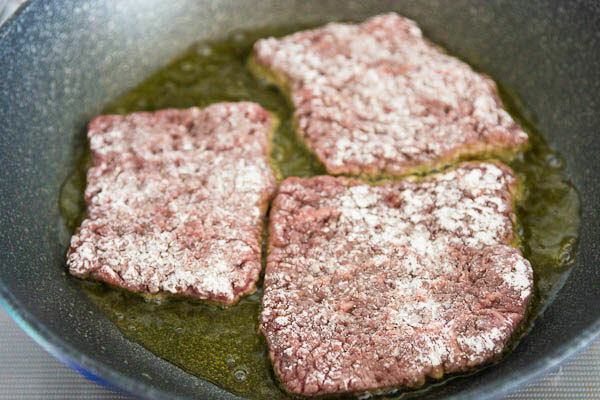 Fry the beef in batches, about a minute-and-a-half on each side, and then transfer to a plate. 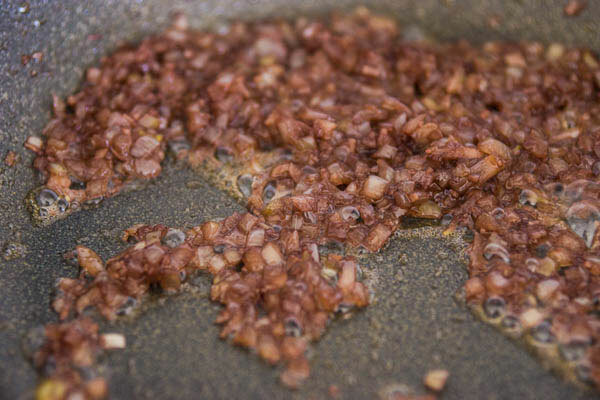 Add the garlic and onions and sauté until well browned and soft. Deglaze the pan with the wine, scrapping up any browned bits off the bottom of the pan. Let the wine mostly evaporate, then add the tomatoes, olives and thyme and then season with salt and pepper. Simmer until the sauce is nice and thick, and then return the beef to the pan. Flip the steaks over a few times to coat evenly with sauce. Be sure not to overcook the beef or it will get tough. 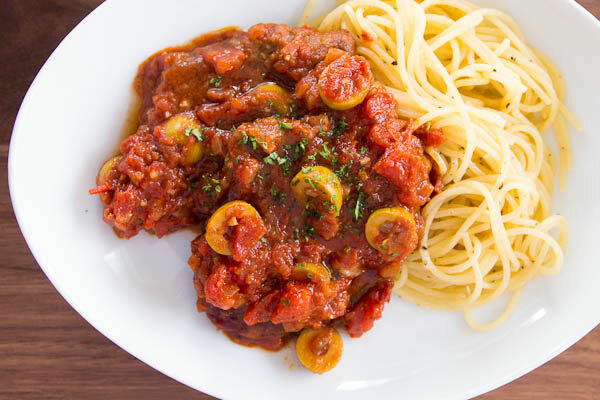 Serve garnished with parsley and some pasta or rice.